My beloved sister and LCY devotee mentioned that a talented and inspiring friend of hers recently tackled a challenging home project with her husband, Neil. 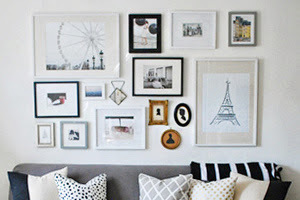 We're not talking hanging drapes or wallpapering a powder room, folks (although both can be challenging in their own right). We are talking installing a stone backsplash in their kitchen. Wet saw and all. I was thrilled when Nikki agreed to share photos and a detailed summary of the experience. Admittedly, my husband and I watch way more HGTV than is probably normal for a young couple. I blame him. When we started dating I watched 24 and Prison Break, while he introduced me to HGTV and The Hills. It’s all of this HGTV that led us to believe we had what it took to install our own kitchen backsplash. Once we committed ourselves to this project we had to choose tile. We looked at a Home Depot and Tile Outlet in Chicago, but were underwhelmed with our choices. Over Thanksgiving, we headed to Cincinnati to visit family and ended up buying everything we needed at The Tile Store in the ‘Nati (and paid half the sales tax of Chicago retailers). Cost to have rented a wet saw: $52 for 24 hours. So we saved about 50% doing it ourselves. The project would have been a bit simpler if we had gone with the glass tiles that were used in most all of the HGTV and YouTube videos we watched to prepare us for this project. Of course, I was adamant that I wanted something visually interesting, so we went with these tiny textured travertine stone with colors that pulled together our light cabinets and dark granite. It seemed like a good idea at the time because the stones fit together so tightly that no grout would be needed. But it ended up making the project much more difficult. In several instances, we couldn’t fit the sheets together because the ‘teeth’ wouldn’t quite interlock. So, Neil ended up having to file down a lot of those tiny stones by hand and then punched the sheets together with his fist to make them fit – that was the most nerve-wracking part of the job because you’re working with mastic that dries in about 30 minutes. And after all this effort, there were hairline gaps between the sheets that were somewhat visible and annoying to us perfectionists. It was then that I was definitely cursing myself for not settling for something a bit simpler. The two smartest things we did to hide those gaps were 1) using the stone enhancer (this made the colors of the stone ‘pop’ nicely and took the focus off the gaps), and 2) we made a trip to Home Depot and bought sand-colored grout to fill in some of the bigger gaps. The grout was the same color as the stone, so it did a fantastic job covering up the lines between the sheets of tile. It all worked out in the end, and after over 20 hours over the course of one weekend we successfully gave birth to our very first backsplash. We would definitely do a project like this again. Yes, we could have hired someone, but it would have cost much more, and we really enjoyed the project. Neil had to sand the edges of these tiles by hand to get them to interlock perfectly. And a good ole' pound of the fist came in hand on more than one occasion. The new stone backsplash gives the condo a much more custom feel and significantly ups the resale value. Bravo, Nikki and Neil! And thanks for sharing with LCY! Count the tiles in the box before leaving the store. We were shorted one sheet, which made things a bit stressful after we miscut our first tile. Purchase the enhancing sealant in the beginning. We bought the standard sealant to start, but my husband talked me into buying the enhancer later. The guy at the tile store made it sound like the enhancing sealant would make the tile very dark. In actuality, it brought out the natural colors in the stone perfectly. Correctly measure our first cut. The tiles interlocked and we accidentally measured from the inner tile edge instead of the outer edge (or vice versa)-either way, we screwed that up even though we both measured it twice. Start on one side and work our way to the other. Many HGTV segments said you should start in the middle and work your way out, but since we chose such a difficult tile to lay we got better as the project progressed. Hence, our best work is on the ends of the wall while our least pleasing work is front and center. Not freak out when there are gaps between the tiles because we would know that sand colored grout could save the day. They seem slightly more attainable knowing it's possible to do it on your own, yes? 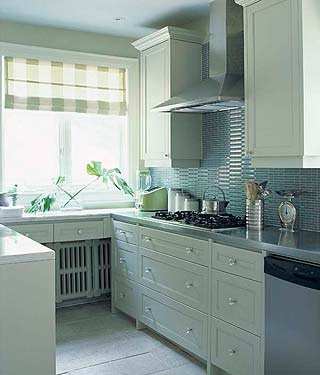 Saw this gorgeous blue backsplash on Colette's Cottage and immediately dragged it to my desktop. 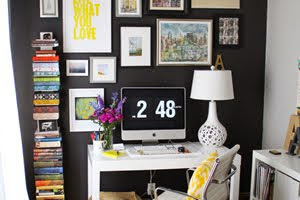 What a happy, bright space! 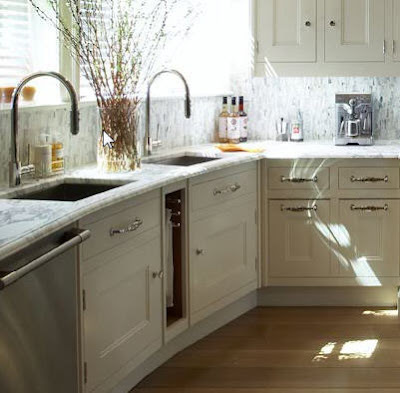 Notice the back-to-back sinks on the island? Genius. I'm not positive, but this looks like tiled marble. I prefer the solid slab of marble as a backsplash, but this is definitely unique! 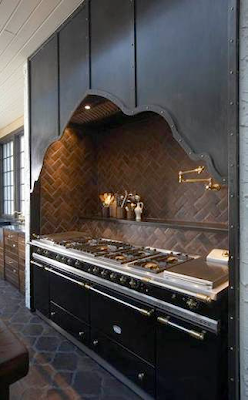 Love this style and color of skinny tile. I also love anything Sarah Richardson does. This look Erin Gates posted isn't for me but snaps on being bold and different. 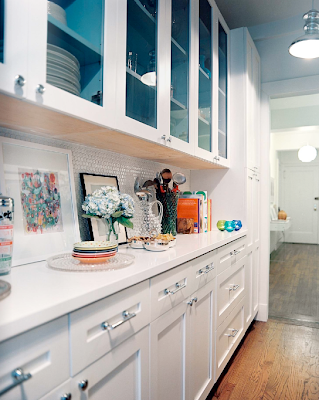 Love how this tiny West Village kitchen was styled! 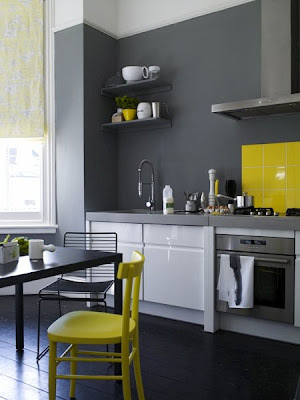 Every home needs a pop of yellow somewhere! In this case, a quick and easy backsplash. 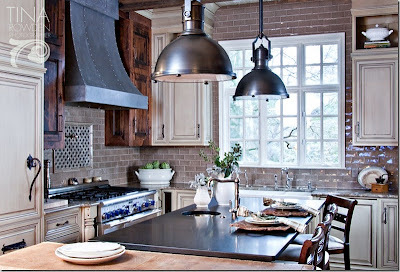 This backsplash is such a great color - actually looks like stone! Nice break from the traditional white subway tile which could have easily been used here. Have a similar project you've tackled?! Want to see it on LCY as part of the I *Heart* My Talented Readers series? Wow, that looks amazing! I'm completely inspired! If I mess ours up, will they come and fix it for me? to think I had trouble painting a room! they did such a great job! What an amazing job Nikki and her husband did. It looks fabulous. Wish I had the courage to do this. Thanks Nikki and Alaina. incredible...i honestly dont think i could ever do that so perfectly...bravo Nikki! Wow! It looks amazing. Nikki and her husband did an incredible job. Great post! love, love, love the tile in your last pic. And having amazing decorating taste and handy-ness must run in your family! LOVE the pedant lights in the last picture of this post! Any idea where I can purchase a cost-friendly version?